This roof leak article explains the causes & effects of loss of protective mineral granules from roof shingles. 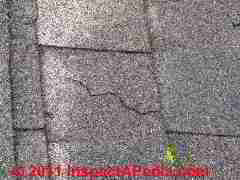 Shingle granule loss defects occur on organic-mat or fiberglass-mat asphalt roof shingles and, depending on the cause and extent of mineral granule loss, the loosening of this protective coating can spell the end of life of an asphalt shingle roof or the demise of a mineral-granule-coated roll roofing roof. Causes & effects of loss of protective mineral granules from roof shingles. Description of different causes of roof shingle granule loss: normal, defective product, storm damage, foot traffic, etc. How to Inspect a Roof for Loss of its Protective Coating of Mineral Granules. 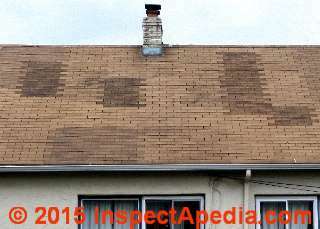 When does granule loss mean that a new roof is needed? This roof gutter sports about an inch of mineral granules that have washed off of the asphalt-shingle roof. Is that a problem? We'll see. Roof shingle granule loss may be normal shingle wear, hail damage wear, or defective roofing product, as we explain here. 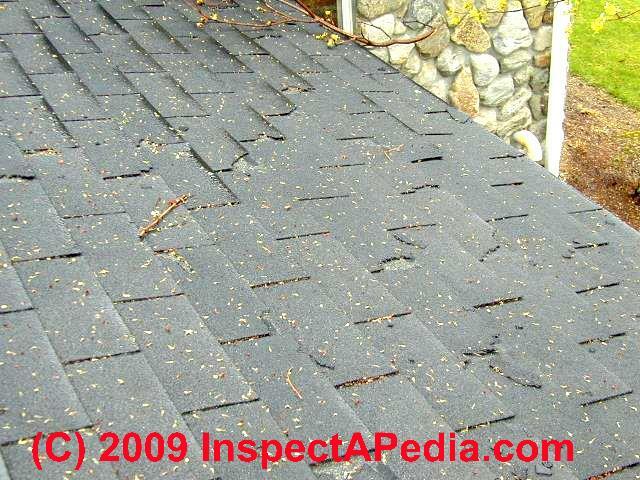 The page-top photograph shows severe loss of mineral granules from an asphalt shingle roof. This "bald" asphalt shingle roof is way past needing replacement and is almost certainly leaking. Even a roof with less dramatic granule loss is showing signs of wear and reduced future life. Readers are also invited contribute roof failure information to the web author for research purposes. web author for research purposes. The job of these mineral granules which are adhered to the roof shingle surface as part of the shingle manufacturing process, is to protect the shingle from sunlight, from UV light, and from the weather in general. The selection of roof shingle color is also determined by the choice of its coating of mineral granule; lighter colored shingles may remain a bit cooler and at least in some applications (hot sunny climates) may have a longer life than dark-colored shingles. 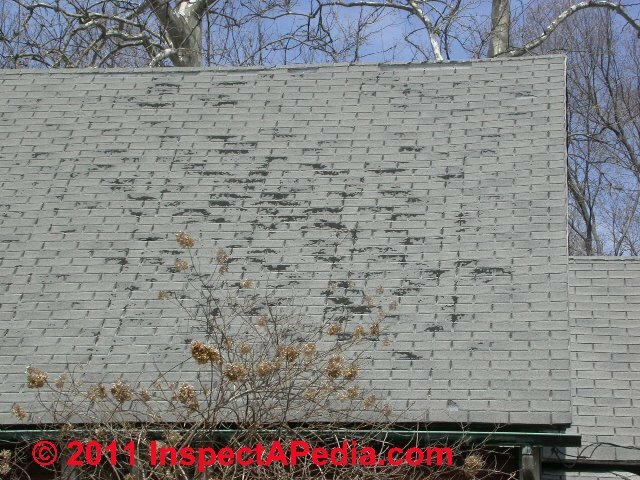 While in our page top photo the roof is "worn out", there are quite a few other conditions that can produce mineral loss on asphalt shingle roofs. Diagnosing the correct cause of granule loss is useful in helping to assess the probable remaining roof life and it may play a role in roof shingle warranty claims or insurance claims related to storm or hail damage. Granule loss on a new asphalt roof, loose mineral granules wash down the roof and will appear in gutters and at the ends of downspouts. You can begin this roof condition assessment at the ground, before even looking at the roof itself. If the roof is reported to be new, the granules shown in our photo are normal and not a worry. [Or they could be there having washed off of an older worn out roof that was just replaced.] Especially right after an asphalt roof has been installed, granules that were loosened on it surface from walking by the installers will wash down and off of the roof surface. Provided the roofers were careful not to dance the Twist while roofing on a hot day, the roof should be fine. But if the granules appear after a hail storm, or if the roof is quite old, they are more likely to indicate roof wear and/or damage. Just take a close look at the shingles themselves for granule loss. And if you clean out the gutters you'll find it easy to see if this granule loss is continuing. Look in the roof gutters for shingle granules too. Roof granule loss due to normal aging occurs over the life of an asphalt shingle roof as weather and sun exposure cause the roof shingle to lose its flexibility, as the roof is exposed to changing temperatures, etc. in ASPHALT SHINGLE LIFE / WEAR FACTORS. Details and photos of normal roof granule loss are at Roof Granule Loss Due to Normal Aging in this article (below). Granule loss due to blistering: blisters or "pimple-like" protrusions from a shingle surface may be a "cosmetic" manufacturing defect (at least in the opinion of the manufacturers). On at least some roofs we find that these blisters ultimately become the first wear points on the shingle when their upper surface wears away (perhaps from foot traffic or weather) exposing small round dots of missing granules on the shingle. Watch out: walking on a badly-blistered roof may cause damage visible as granule loss or pits. Granule loss on old asphalt shingle roofs: when an asphalt shingle roof is nearing the end of its life we may see that granules have begun to wash off of the shingles so as to leave large "bald" or nearly bald areas showing black shingle substrate. These shingles have more porosity than those where their mineral granules remain in place and may already be leaking even if leaks are not quite visible in the building interior. Such a roof is ready for replacement. 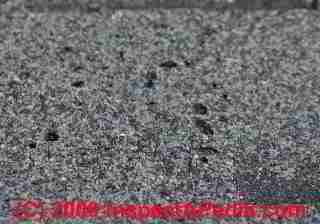 Granule loss on a roof being walked-on: walking on any asphalt shingle roof loosens some of the mineral granules from their attachment embedded in the asphalt used to impregnate and coat the shingle. If there is a lot of roof traffic, such as when work is being done on a chimney, you may see "bald" areas of shingles with lost granules where people have been walking. The (older, more brittle) roof at left suffered both granule loss and cracked shingle corners after it was walked-on. This is damage caused by workers and is not a product defect. Some examples and photos of shingle damage that occurred at least in part due to foot traffic on a roof, and that produced lots of granule loss from the surface can be seen at MECHANICAL DAMAGE of SHINGLES. At an arbitration hearing involving a roof dispute we could actually track the footprints (and damage) across an older roof that had been walked-on (and damaged) by the very contractor who told the owner she needed a new roof. (Don't walk on fragile roof surfaces). Granule loss on asphalt shingles due to storms, especially hail: it is possible that severe weather, such as hailstorms, may damage shingles producing pitting and granule loss. 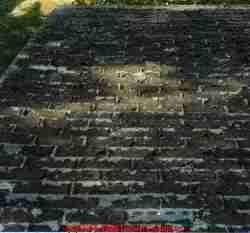 Such roofs have a reduced remaining life, depending on the severity of damage. 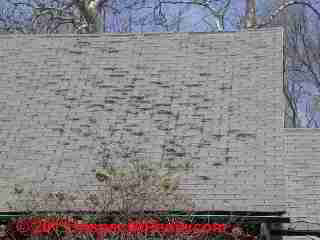 See HAIL DAMAGED SHINGLES for more detail on this source of asphalt shingle roof damage and for more photographs of asphalt shingles that have been deprived of their protective coating of mineral granules. The organic felt-based asphalt shingles shown at below left has lost some granules into the roof gutter but an inspection of the shingles themselves showed no significant bald areas. We had to look closely at those shingles in the upper right of the photo and we decided the wear was probably due to foot traffic as well. The organic-mat asphalt roof shingle shown at right, also showing normal wear, is completely worn out, showing shingle substrate, sun and heat damage, and basically, that the roof needs to be replaced. A shingle like the one shown is usually so fragile that stepping on it breaks it into many small fragments. These shingles (above right) may already be leaking into the roof substrate, placing water between the shingle and its felt underlayment, between the underlayment and the roof sheathing, or leaks may be entering the roof structure. Even if there is no visible evidence of leaks in the living area (such as stains on top floor ceilings or visible water in the attic) this roof is at the end of its life. Wherever and whenever a roof shingle has lost the protection of its mineral granules that shingle has a reduced life expectancy. In all climates the loss of granules means that area of the roof shingle has lost its protection from sunlight. In freezing climates, shingle wear may accelerate in the area of lost granules as the roof ages and is exposed to freeze thaw cycles. Roof shingle granule loss due to defective roofing product usually exposes the shingle substrate in "premature bald" patches and is identified by bald spots or exposed shingle substrate on roofs early in their chronological life, often distributed uniformly over the roof or in areas of the roof where shingles from a particular pallet of roof shingles were installed. 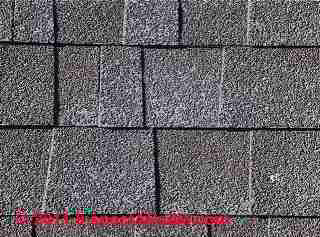 Below (left), the picture of bald areas in this laminated asphalt shingle or "architectural shingle" roof show white fiberglass roof shingle substrate. Our OPINION was that this was a defective roof product. This same roof also suffered thermal splitting or tearing damage (below right). Photos of roof damage below were provided by ASHI Home inspector Steve Mauer and photographed in 2009. 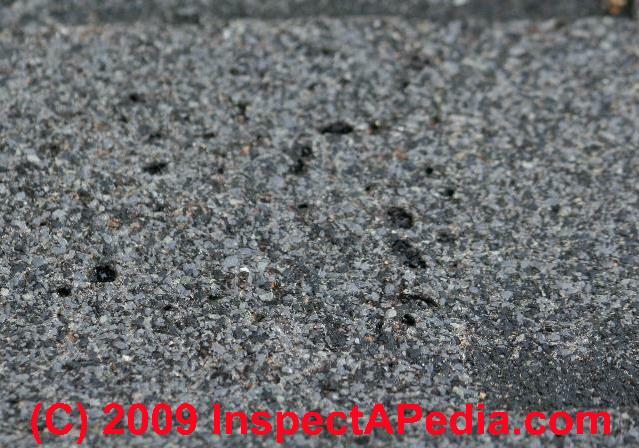 Our OPINION is that the asphalt roof shingle granule loss shown at below left is due to a defective product. The shingle tearing and splitting shown below on the same roof is also often a product defect referred to as thermal splitting. 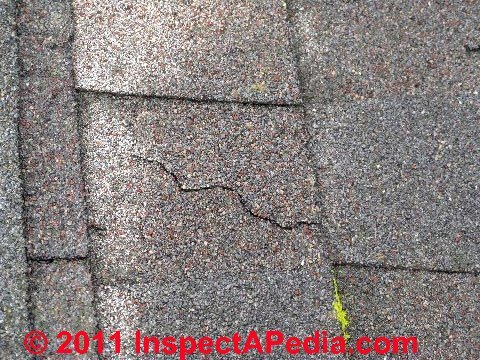 See CRACKS in FIBERGLASS SHINGLES for an explanation of splits or cracks in asphalt shingles. 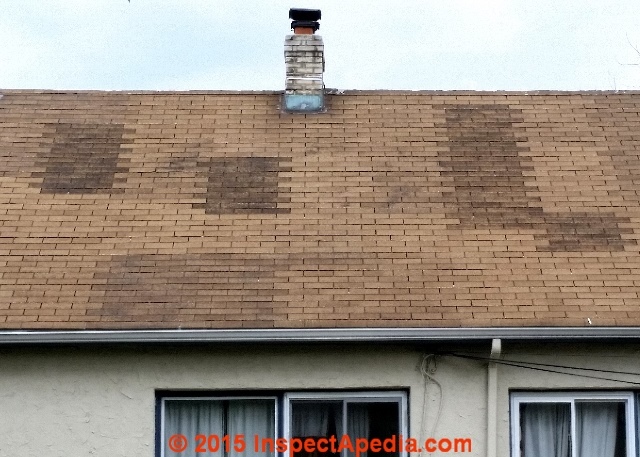 The roof shown above was observed on a home in Haddonfield, New Jersey in the U.S. That the shingles were installed in a ladder pattern has become obvious as sections of these roof shingles have lost more granules than their neighbors. The loss of the tan colored mineral granules is leaving the black asphalt shingle substrate exposed. Laddering or stair-step installation of shingles is not the best roofing practice and it, too, can contribute to other roof wear or leak problems that we don't see on this roof, but laddering is permitted by roofing installation practice guides. See LADDERING vs STAIR STEPPING SHINGLES. However because shingles installed in a ladder pattern tend to be grouped in batches of shingles were set on the roof for installation from individual shingle bundles, often the loss of mineral granules not only tell us the shingle installation pattern but also they tell us something about variation in shingle durability or variation in shingle granule loss in individual bundles of shingles that otherwise were (probably) manufactured in the same production run. This distinction is significant. If all of the shingles on a roof were produced in the same manufacturing run but if we then see that groups of shingles wear differently even though installed on the same roof slope, exposed thus to the same sun and weather conditions, we can infer that there were variations in condition among the individual bundles of shingles. Typically three bundles of shingles make up one square (100 sq .ft.) of roof covering. A common explanation of this variation in shingle durability by bundle is improper shingle storage such as leaving a pallet of roof shingles exposed to weather for some time before they are used. Shingles on the top of the pallet become rain-soaked and may suffer damage. The critical place to evaluate the condition of roof shingles is at the edge of or (if safe and the roof is not fragile), on the roof itself. Look closely at those shingles - get down on your hands and knees and look closely for early wear signs such as tiny bald spots, pits, cracks, or other damage. If you can't see obvious bald areas from which the protective granules have been lost from the shingle, it's unlikely that granule loss is a current problem. The photograph at above left shows a modest amount of mineral granule wash-off into the gutter of this home. If the roof is a new one, this may be a normal amount of granule loss. 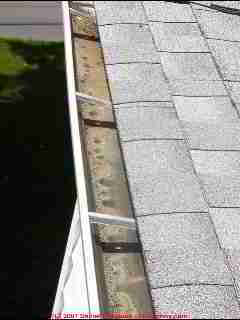 When the gutter is cleaned out completely, you should not see this same level of mineral granules again soon. If you do, there may be a rapid wear problem going on with the roof, or someone may be dancing on it. 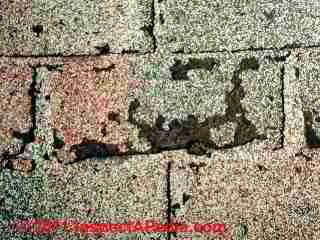 The photograph above shows a significant loss of mineral granules into the gutter on this roof. A look at the scoured surface of the roof shingles and a report by the owner of a recent and significant hail storm suggest that this granule loss may have been due to hail damage. we discuss evaluating hail damage to roofs and how to distinguish hail damage from other sources of shingle granule loss at HAIL DAMAGED SHINGLES. 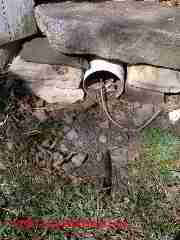 Check the ground surface at the end of the downspouts or roof leaders. If you see lots of mineral granules there the roof is either brand new or badly worn. A check of the roof surface easily distinguishes between these two conditions. Extensive shingle granule loss alone, sufficient to expose the roof shingle substrate, means that the wear rate on the roof will accelerate. That's because the shingle body is exposed to direct sun and in freezing climates because the exposed shingle substrate begins to absorb water, suffering from the freeze-thaw cycle. In other words, once the shingle substrate is exposed by mineral granule loss, that area of the shingle will absorb more water than its neighbors. 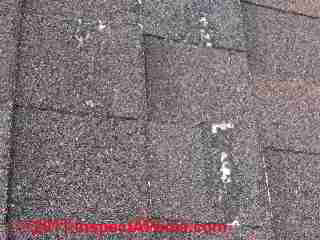 When shingle granule loss is extensive or when it is combined with other roof defects (such as tears, cracks, brittle shingles that can't be walked-on for patching, or more than just a very few readily-accessible (patchable) defects, those will usually form a sound basis for asserting that the roof is already leaking (at those cracks) even if water has not appeared on finished ceilings inside the home, and they both argue that this roof has no predictable useful remaining life. Question: is breathing roof shingle granules dangerous? Is it dangerous to have wind blowing this around if we breath it in the air when outside our home. Roof shingle mineral granules are pretty heavy and ought not be airborne except in really extreme weather - they are not normally "resipirable" (able to be breathed-in) - though dust from ground roof debris along with anything else on the ground may be airborne at lower wind velocities. High levels of airborne dust are a respiratory irritant for almost anyone and will contain unknown materials from soils and just about anything else in the wind path, some of which could be hazardous. Shingle granules produced by 3M (which covers most shingle and roll roofing products used in North America) contain mixtures of natural ingredients such as feldspars, along with quartz, and additions of ceramic material, inorganic pigments, oil, titanium dioxide, chromium oxide, and carbon black. A good place to look for potential hazards of these substances as with any material is in the product's MSDS (Material Safety Data Sheet). Granules are not respirable. Dust generated during handling may contain respirable material. Contains a chemical or chemicals which can cause cancer. Signs/symptoms may include cough, sneezing, nasal discharge, headache, hoarseness, and nose and throat pain. Continue reading at HAIL DAMAGED SHINGLES or select a topic from closely-related articles below, or see our complete INDEX to RELATED ARTICLES below. 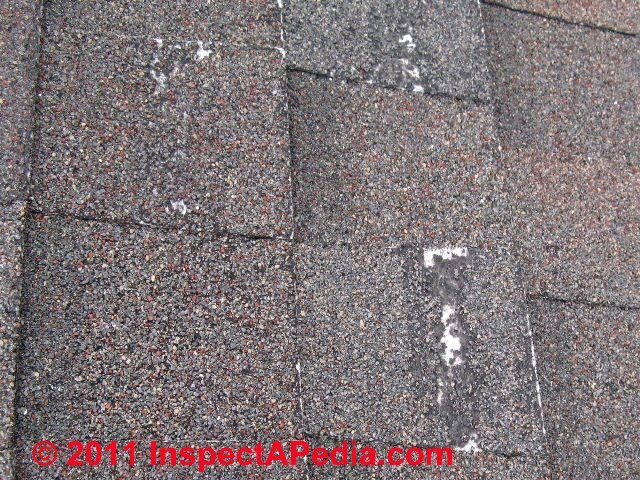 GRANULE LOSS from SHINGLES at InspectApedia.com - online encyclopedia of building & environmental inspection, testing, diagnosis, repair, & problem prevention advice. Thanks for the important roof shingle warranty question, Spencer. Now it's time for a dose of painful reality. What follows is my OPINION. Roof shingle warranties vary, and you don't mention the brand and model of your roof shingles so we don't know what your warranty promised. Usually shingle warranties, even "lifetime" ones, are actually quite limited. IF the manufacturer agrees at all that the product is defective, you'd expect recover a portion of the shingle material cost, pro-rated based on the percent of roof life promised vs. delivered.When the roof has lost granules such that its remaining life is likely to be reduced and when we are now at 1/2 of the roof's rated life, but the roof is not yet leaking, the manufacturer is going to argue that the roof has not yet "failed" - it's not leaking. So they are re-adjusting the 50% of shingle material cost to a smaller sum which is the manufacturer's own opinion of the amount of reduction from the 25-year life that has been caused by the roof's deterioration. They may not enjoy explaining that to you but that's probably the rationale behind the pathetic warranty offering. The manufacturer will also adjust the warranty coverage for a roof based on their own observation of installation defects including virtually anything that did not completely follow the manufacturer's installation instructions regarding product selection, underlayment, nailing schedule, condition of the roof deck, flashing details, roof ventilation details and perhaps other conditions (such as mechanical damage from ice dams). The cost of a roof leak in damaged building insulation, wiring, finish materials, drywall, and potentially mold clean-up can also be a significant cost that won't be covered by roof warranty even if the roof is actually leaking. The labor to install roof shingles is normally a much greater cost than the materials, a third fact that makes roof shingle warranties of only very limited value. What we learn from this is that product warranties are more of a marketing feature than something intended to actually protect the consumer. Roof shingle warranties may tell us something about the comparable expected life of different roof products but they're not particularly valuable as insurance against early roof leaks. See WARRANTIES for ROOF SHINGLES - at https://inspectapedia.com/roof/Roof_Warranties.php for a series of articles about roof warranties and collecting on them. In corresponding with readers about this topic for decades now I've seen that just what the roof manufacturer or roof installer offer in settlement varies considerably depending in part on how much trouble the consumer is making and how persistent is the consumer in pressing a claim as well as on the difference between large commercial jobs and residential roof jobs. Asphalt shingle test labs offer product testing services that can explain why a shingle product is failing or appears defective, such as loss of volatiles, over-heating during manufacture, or other manufacturing or service life defects. You could try asking one of these labs to test representative samples of your roof; you'd need to photo-document the whole roof, document the product, its installation details, and other information, then cut samples, patch the cut area, and send your samples to a test lab. I would of course be interested in what the lab tells you - we'd all benefit from that if your case were adequately documented. But I warn that YOU are not an important customer to the roof shingle test lab. The roofing manufacturers may use independent asphalt shingle test labs to monitor and assess their own manufacturing process. They, the manufacturers, are far more important customers to the lab than you. Therefore you might find some reluctance on the part of test labs to help you prepare material that will in turn be used to annoy their main client. Do keep me posted, and do use the page top or bottom CONTACT link to send me sharp photos of the whole roof, varying conditions by roof slope, and close-ups of granule loss on shingle surfaces as well as of the lost -granules that you probably see in your gutters or on the ground. I have a roof of 12yrs with 25yr shingles on it, I noticed significant granule loss on 90% of whole roof on the single layer part of arc. shingles. I contacted manufacturer and they only offered 384.00, then I contacted local representative and he's only offering about 1,700. Now I am a Home Inspector and know from experience this is a manufacturers defect because its on 90% of roof and certain parts of each shingle. Problem is I feel they should honor their warranty of full replacement, so how do I go about getting independent testing of shingles to determine if it was manufacturers defect to go after company ?? Any help would be appreciated !! Question: what about the effects of roof color? Thank you Selesa. We provide considerable information on roof color options, best roof colors for various climates, etc. I have a 30 year roof that is 8 or 9 years old. I had a roofing company look at the roof, and they stated we needed a roof. (90 percent of my neighbors have gotten a new roof, due to a major hail storm). My insurance company sent an independent company to look at the roof, and stated we did not need a roof. However, we are seeing lots of granule loss running from the gutters when it rains. How much of the life of the shingles is lost when the granules come off during a storm? I would assume that a 30 year roof would be in adequate condition, if it did not have a major hail storm effect it. In GENERAL a 30-year rated asphalt shingle roof that's less than 10 years old ought to be less than half way through its anticipated life; A specific roof might be in worse shape due to a variety of factors: installation, foot traffic, mechanical damage, inadequate ventilation, or as you pose, storm damage. 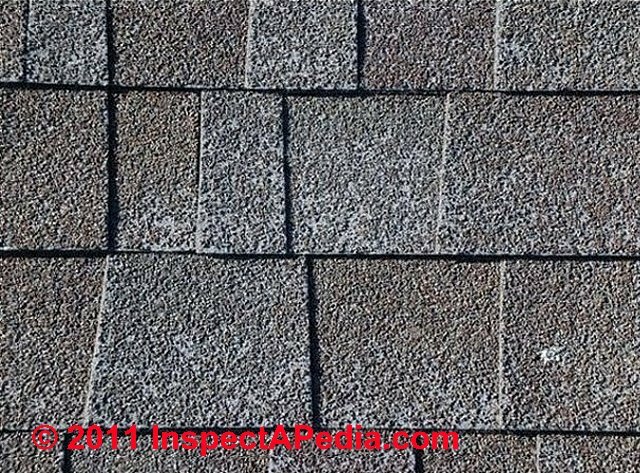 Search InspectApedia.com for HAIL DAMAGED SHINGLES to get details about how to recognize that situation; do keep me posted; use the page bottom CONTACT link to send long photos of your roof condition if you like.